Pool's Renaissance man wants to be remembered for his Hall-of-Fame heroics. In the 1970s, Hopkins forged his game in the crucible of straight pool. Allen Hopkins could have gained entry into pool's most exclusive club - the Billiard Congress of America Hall of Fame - any number of ways. There is Hopkins, the promoter. For 16 years, Hopkins (with his wife, touring pro Dawn Hopkins) has produced the industry's only true consumer trade fair, the Super Billiards Expo. The Expo annually draws more than 150 exhibitors, who show off the latest and greatest in pool gear to nearly 3,000 amateur players (who participate in numerous events) and countless more curious consumers. The annual event has enjoyed incredible consistency in an industry that has been forced to endure an economic rollercoaster ride. There is Hopkins, the television personality. One of the game's best (and quickest) minds, Hopkins has been a staple in the commentary booth on televised pool matches for some 25 years, offering keen insight and honest opinions to millions of pool fans. Hopkins' early TV fame came as Minnesota Fats' partner in matches against Willie Mosconi and Steve Mizerak on network television in the late '70s and early '80s. There is Hopkins, the innovator. Hopkins was instrumental in developing the long-running Challenge of Champions with promoter Matt Braun, and devised both the Skins Billiards and Texas Hold 'Em Billiards programming for ESPN. He also co-promoted ESPN standards Trick Shot Magic, Sudden Death 7-Ball and the Ultimate 9-Ball Challenge. But there was only one route Hopkins wanted to take into the BCA Hall of Fame. "It was really important for me to get into the Hall of Fame on the merits of my playing career," said Hopkins, now 56, after learning of his election into the Greatest Players wing. "I'm proud of my other accomplishments, like the Super Billiards Expo. But I didn't want to get in as a promoter. I made my mark in billiards as a player, and that's how I want to be remembered." And Hopkins' playing resume is plenty impressive, with major titles in straight pool, 9-ball, 10-ball and one-pocket winning his first crown (the 1977 Professional Pool Players Association World Open) in the '70s and his last major championship (the 1999 Camel Denver 10-Ball Open) in the '90s. Overall, Hopkins garnered more than 40 tournament titles during his 30 years as a pro. (He also may hold the record for most second-place finishes in the history of professional pool.) In addition to the '77 world 14.1 title, Hopkins has a pair of U.S. Open 9-Ball Championships ('78 and '81) to his credit. 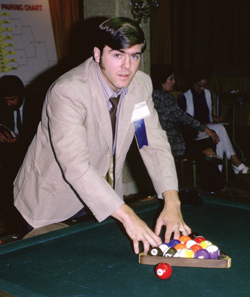 In fact, the 1978 U.S. Open - played on promoter Barry Behrman's notoriously stingy, tight-pocketed tables - was double-elimination with race-to-15 matches. En route to the title, Hopkins dispatched fellow Hall of Famers Mizerak, Mike Sigel, Jim Rempe and Dallas West. And that's an element often missing during conversations about Hopkins' career. It's unlikely that any period over the last 40 years was as thick with Hall-of-Fame caliber pool talent as the period stretching from 1970 to 1985. Real talent. Knowledgeable talent. Players with straight-pool pedigrees whose ability to correctly maneuver around the table made them dangerous in any cue discipline. "It was tough playing around the East Coast back then," noted Hopkins, who was raised in Cranford, N.J. "If you wanted to survive, you learned how to play pool the right way. No one ever gave you a shot. You had to earn them." Survival meant battles with everyone from Luther Lassiter, Irving Crane, Cisero Murphy and Ray Martin, to Hopkins' more immediate contemporaries - Sigel, Mizerak, Rempe, Petey Margo, Larry Liscotti, Gene Nagy, Jimmy and Pete Fusco, Johnny Ervolino and more. "It was tough playing around here in those days," added Hopkins, who now calls Port Republic, N.J., home. "Just winning a weekend tournament at Mizerak's room or at Mike Ash's Hi-Cue Billiards [in Elizabeth, N.J.] was like winning the U.S. Open."